Topic October / November 2017. It has always been something of a puzzle as to what happened to the men of the famous Manchester Troop of the Legion who served with the 3rd Belgian Lancers after the “British Colonial Horse” was disbanded. Any research has not been assisted by the fact that most of the men’s surnames were far from uncommon. We do know that Robin Everingham was wounded at the Battle of the Yser. On recovery from his wounds he joined the Welsh Horse which, incidentally, was formed by a Frontiersman.¹ He fought at Gallipoli where he was killed by a sniper on 10th December 1915.² Bertram Davisson was commissioned in the Royal Garrison Artillery and survived the War, but not for long. He was married at the beginning of the War and no doubt his wife was relieved that he was one of those who came through it without serious injury. Just before the Armistice he was gassed and with damaged lungs he was one of the many who succumbed to the great influenza epidemic, which killed him leaving his young wife as yet another grieving widow. Charles Edward Critchlow was commissioned in the Manchester Regiment. He was killed on the first day of the second Battle of Passchendaele, 26th October 1917. He was one of seven officers of his battalion killed that day. His remains were never found. He was probably one of many whose bodies sank into the awful mud. He is remembered at the Tyne Cot Memorial in Belgium. He never got to marry his sweetheart. All he could do was to mention her in his will and leave her also grieving. The camouflaged trains were held, manned, under steam, and with guns loaded a few miles away from any action. Those unexpected guns arriving on rails silenced many an enemy battery and the trains had passed before the Germans could get their range. The armoured trains suffered virtually no casualties. It is thought that other members of the Manchester Troop also other Frontiersmen joined the Royal Naval Division. Why was that? Sounds very like the Frontiersmen. One such Frontiersman who gravitated to the Royal Naval Division was Australian Walter Kilroy Harris. As with many Frontiersmen, some of his peacetime exploits cannot be verified. From 1912-1913, Kilroy Harris was believed to have been working as a journalist in England, and was also affiliated with the Australian government’s immigration office. Harris received a Legion commission as a captain in the Australian Command of the Legion of Frontiersmen. His popular 1913 book “Outback in Australia” was re-printed several times. It tells of his journeys across that vast land. His travels included a ride of 800 miles on horseback from Sydney to Brisbane; a cattle-droving trip of 1700 miles; a journey of 2400 miles in a one horse sulky from Sydney to Adelaide and back; and a drive of over 2000 miles from Sydney to Broken Hill and back. He became the youngest Fellow of the Royal Geographical Society. In December 1914 he was on his way from Australia to report in to Legion headquarters in London when, according to him, he was asked to remain in San Francisco to carry out secret work for the War Office and then carry despatches across America to Washington. We say “according to him” as we will later discover that, although his bravery was without question, his claims were not always to be trusted. He was no different in that respect to many a Frontiersman. On arriving in England he joined King Edward’s Horse, another natural destination for Frontiersmen, but within ten days he was granted a commission in the Drake Battalion of the Royal Naval Division and sent to their training depot at Crystal Palace, London. All ideal for the views and ethics of a Frontiersman. Walter Kilroy Harris was a very brave and effective officer. He is believed to have been one of only three men to win the D.S.O. as well as the Military Cross three times. He was wounded on four separate occasions (three times slightly wounded, remained at duty), and was once slightly gassed. His last wound, a bullet in the head, rendered him temporarily unfit for active service. Towards the end of the War he was sent over to America on special lecturing duties. This is another small puzzle. He was not the only British officer given those duties. The War Office was keen to send recovering officers to the U.S.A. on what was basically a propaganda mission. One R.N.D. officer who applied but was not successful was Douglas F. Jerrold (1893-1964). Jerrold wrote the official history of the Royal Naval Division in the Great War. Other than that work, Jerrold’s writings are ignored by most academics as his political views were very right-wing. He was a devout Catholic and also a supporter of Franco and one of the leaders of the expedition to bring Franco back from exile, in which he involved Hugh Pollard – see: Tasting Adventure and Revolution for details. Although he was politically very much a right-wing Tory, Jerrold held a poor opinion of the inhabitants of the War Office and the “Colonel Blimp” types often commanding Divisions and Corps in the Army.⁸ He was friends with several Frontiersmen, notably Hugh Pollard, but never joined the Legion. His views and interests were too political. The request for officers for America stipulated that nobody under the rank of captain could apply. Jerrold held the rank of lieutenant R.N.V.R., which was the equivalent rank to captain in the Army. (Explosion during the course of which the Army Order was held up to my nose). Can’t you read? A little, sir. (This was, of course, a tactical blunder but irresistible). I don’t understand you. Are you, or are you not, a captain? Very well, then, are you a captain in the navy? In spite of Jerrold attempting to explain equivalent ranks, the desk officer would not budge. The order said “captains” and he could not budge from that. Walter Kilroy Harris was also a lieutenant, R.N.V.R., but he held the Legion of Frontiersmen rank of captain, so he may well have used that rank to satisfy the needs of the official order and the desk-bound senior officer carrying out interviews. On returning to Australia after the war, Harris leased a parcel of land from the Australian Settlement Board. Australia was not the only country to offer land to returned soldiers. Canada had a similar scheme and we know that Fort Scott in Alberta had originally been soldier settlement land, but unsuitable to farm profitably. Harris was to show that although he had been a brave soldier and a successful officer like a number of Frontiersmen he was not averse to making a few dollars by law-breaking. “Harris treated Soldier Settlement as his own cash creation scheme. Before breaking the lease, Captain Harris sold, without permission from the Department, a mare, dray, and harness. The purchaser, Mr. Gorman, claimed he paid Harris £20 cash, and had thrown ‘a cow and calf, valued at £10’ into the bargain. And that was not the worst of it: ‘It would appear that Harris, not content with having fraudently [sic] used the £20 in cash, produced a receipt for one Jersey cow and calf at £10, and sought to obtain payment thereof.’ Keen to make good its losses, the Lands Department arranged for the sale of Harris’ property. Harris challenged the legality of the auction, disputed the amount of his indebtedness to the Department then booked his passage for the United States to give a lecture tour. Captain Harris appears to have found his war record as saleable as the Department’s stock. An article from the Illustrated Tasmanian Mail described him as the ‘founder of the America-Australian Bureau, a soldier whose gallantry in the field of battle earned for him both the D.S.O. and the M.C….the right type of Australian to engage in propaganda work in the U.S.A.’ The America-Australian Bureau (one of several grandiose initiatives Harris was involved in) was ostensibly founded for the purpose of ‘boosting Australia’. Its more immediate purpose was to boost Captain Harris; within a week of opening for business, Harris had approached all the State governments for a subsidy of £50. Harris was arrested and gaoled before he filed for bankruptcy. He then ‘escaped’ to Ohio. Harris may have been a war hero, but he was also a fraud and a braggart. Kilroy Harris travelled the United States being paid very well for giving lectures on his wartime and travel adventures. Eventually he settled entirely in America and his “Radio Travel Talks” were very popular on early American radio programmes. This set something of a trend in travel talks on radio. 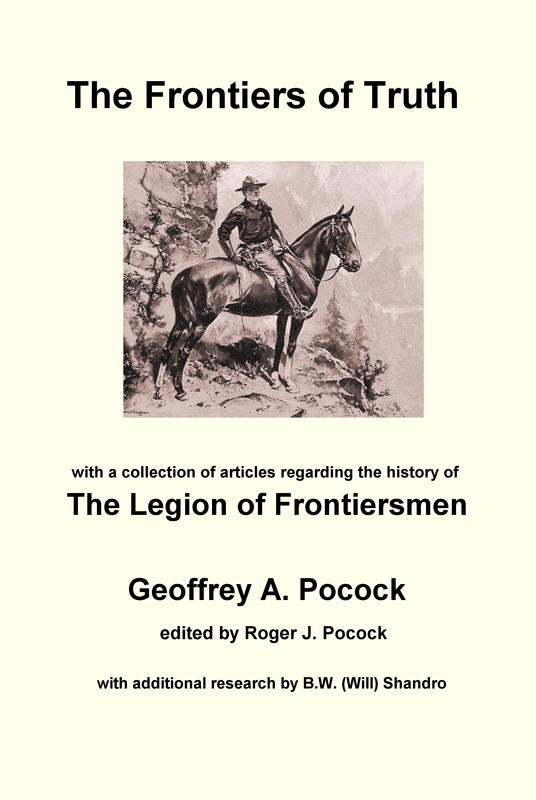 He wrote regularly to the “Frontiersman” magazine which reported on his activities. We saw in the previous topic page how Percy Escott North continued that trend of travel talks on radio. There is no doubt that Walter Kilroy Harris was a very brave man but, like plenty more of the early Frontiersmen he had his share of character failings. That makes him all the more more interesting to us! ² Everingham is listed in de Ruvigny’s Roll of Honour. His name also appears on the Gallipoli Roll of Honour of the 1/1st Welsh Horse in the Welch Regt. museum. ³ Sir J.A. Hammerton: “A Popular History of the Great War, Volume 1” (The Fleetway House, n.d. c.1934) pages 496-7. ⁴ Douglas Jerrold: “The Royal Naval Division” (Hutchinson, 1923) p.56 (the reminiscences of Hugh Lunn). ⁵ Jerrold: “Royal Naval Division”, p.44. ⁶ Douglas Jerrold: “Georgian Adventure” (Collins, 1937) p.110. ⁷ Unidentified New Zealand newspaper cutting 13 June 1918 by “Frontiersman” (probably Ernest d’Esterre), located by B.W. (Will) Shandro, Canadian historian, in F.V. Longstaff scrapbook files: British Columbia Museum, Victoria, B.C..
⁸ See: Jerrold: “Georgian Adventure, pages 121-124 and 206-207. ⁹ Jerrold: “Georgian Adventure” p.208. 10 The Last Battle: Soldier Settlement in Australia 1916-39, Bruce Scales and Melanie Oppenheimer, (Cambridge University Press 2016), pages 41-42.